You’ve done it. You’ve made the decision to purchase a preowned Rolex watch. But, with so many amazing models to choose from, which Rolex should you invest in? As a result, we’ve compiled the most popular BeckerTime Rolex watches of all time for a bit of inspiration as you make your selection. Rolex is the most iconic brand of watches, and the Submariner is the most iconic Rolex. The Submariner was debuted at the 1954 Basel Watch Fair. However, the Submariner wasn’t intended as just a piece of jewelry, but as a diving tool. While popular in the diving community, it wasn’t until the Submariner appeared on James Bond’s wrist in “Dr. No” that the Submariner would become the most coveted Rolex. 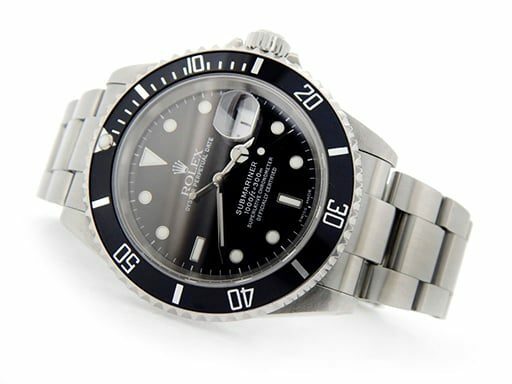 One of our favorite preowned Submariner models is the Men’s Rolex Stainless Steel Submariner Black 16610. A modern model from the early 2000s, this 40mm watch follows today’s trend for a larger-sized watch. Guaranteed to impress, this model features the highly desired SEL Oyster band. The Rolex Submariner caters towards men and features only one size. Yet, our other most popular preowned Rolex model includes several sizes perfect for both men and women. Released in 1945, the Datejust is one of the most recognizable and desirable Rolex models. The Datejust was the first Chronometer with an automatic calendar feature, hence the name “Datejust”. Originally created to celebrate Rolex’s 40-year anniversary, the Datejust featured a new bracelet called the Jubilee bracelet. Today, the Datejust comes in several varieties, designs and sizes. Also, it’s available in both men’s and women’s models. These sizes include 26mm, 29mm, 31mm, 36mm and 41mm. 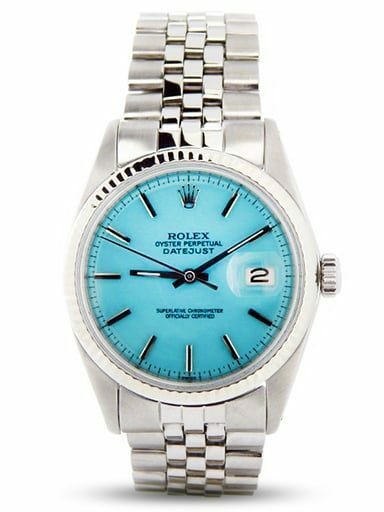 One of our favorite Datejust models is the Men’s Rolex Datejust Ref 1601 Stainless Steel with a custom refinished Turquoise Dial. So, what’s not to love about this turquoise dial? At 36mm, this watch is modern, yet continues to capture the allure of the original Datejust models, including the stainless-steel jubilee bracelet. We would love to help you choose from some of most popular BeckerTime Rolex watches. We offer a large selection of preowned Rolex timepieces, paired with our personalized customer service, to help ensure you find the perfect watch at the right price.